Uniform layers are cut all over this hot red mane to achieve a well balanced style that is easy to dress with product to create this full shaped hairstyle. This look is perfect for those wanting a versatile look that is easy to manage with regular trims every 4-6 weeks. Kate Mulgrew goes for a cool windswept look here with great results. This high volume â€˜do makes the most of her round face shape and keeps the focus on her eyes. This hairstyle is layered all over, with the back longer than the top and sides. To style, the hair is blown back off the face and extra lift is added at the crown, which gives her round face shape a more oval appearance. This hairstyle is ideal for women who have fine to medium hair with some natural wave or curl in it. Working with her warm, freckled complexion, Kate has opted for a dark copper red hair color, which brings out her natural glow and intensifies her blue eye color. She also has some subtle blonde highlights throughout for a sun kissed look. This haircolor will suit those with a medium to fair skin tone and light eyes nicely. 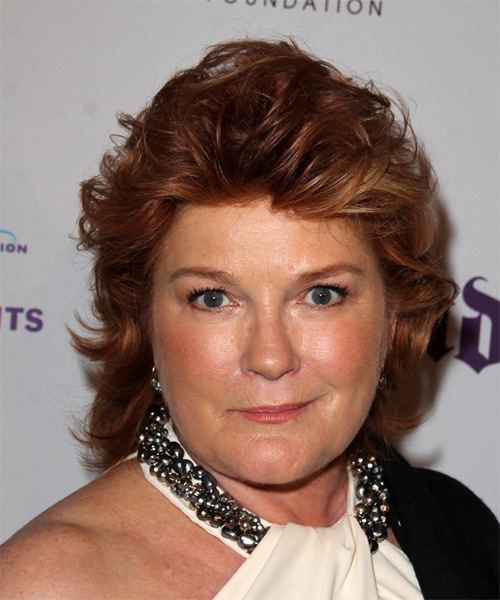 Kate Mulgrew is an American actress who is known for her roles on Star Trek: Voyager and Orange is the New Black. Tease your hair at the roots for height and control. Apply some moulding cream to your fingertips and then rub it into your roots while lifting your strands for added body. Be sure not to use too much moulding cream at the roots as this can result in a glugy and thick uncomfortable feel. Apply moulding cream to your fingertips and then pinch small clumps of hair in an up and forward motion. Pinch the clumps in different directions for a messier look. Apply a small amount of moulding cream to your fingertips and then lightly piece and pinch the ends of your hair.